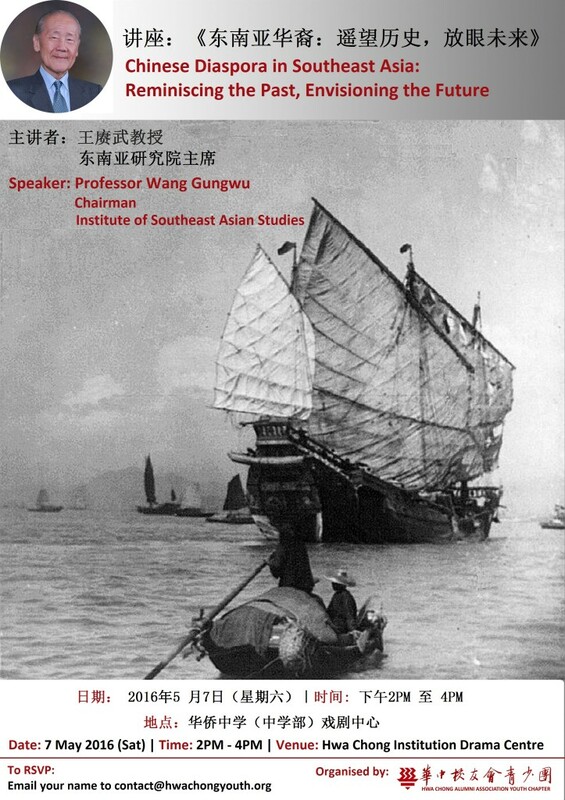 Prof Wang Gungwu will be speaking next week on the topic of “Chinese Diaspora in Southeast Asia”. Come enjoy the lecture! The Hwa Chong Alumni Association invites all members of the Hwa Chong family to submit designs for the Hwa Chong Cultural Centre Logo Design Competition. The winning design selected will appear as the logo for our new Hwa Chong Cultural Centre. Check out our microsite at www.hwachongyouth.org/web/logocomp for more information! Into its 8th year, Hwa Chong Past vs Present was started in 2008 to provide past and Hwa Chong Institution and Hwa Chong International School students a platform to gather and engage in friendly sports competitions with students of their age and also with alumni. This year, Nanyang Girls High School will also be included in this, making this event Past vs Present vs Future. PVSP 2015 will be held on 6th September 2015 (Sunday) morning across the Hwa Chong campus. Form your teams and sign up at http://hwachongyouth.org/web/pvsp2015 before 3 September 2015. The Hwa Chong Alumni Association invites all members of the Hwa Chong family to submit designs for the Hwa Chong Car Decal Challenge 2015. The theme for the Car Decal Challenge is “The Hwa Chong Spirit”. The winning design selected will appear on more than 10,000 windshields when the decals are issued on the institution’s 96th Anniversary. Submissions will close on 12 March 2015 (Thursday) 5pm. Voting by most number of likes on Facebook will be from 8am on 13 March 2015 to 8pm on 15 March 2015. The Hwa Chong Car Decal Challenge is opened to all members of the Hwa Chong Family. This includes all students, staff and alumni of both Hwa Chong Institution (as well as formerly The Chinese High School and Hwa Chong Junior College) and Hwa Chong International School. Each qualifying individual can submit unlimited entries for the Challenge. Each individual can submit as many photos as he/she like. Each entry should comprise both (a) the car decal design image and (b) a caption of not more than 50 words explaining the design. To be considered for the Car Decal Challenge, all entries must be submitted by 12 March 2015 (Thursday) 5pm. You will receive a confirmation reply within 1 working day of your submission. Winners will be notified via email or phone by 16 March 2015. Winners will be presented their prizes on the Hwa Chong 96th Anniversary Dinner on 21 March 2015 (Saturday) Evening. Hwa Chong Past vs Present is a series of games for past and present Hwa Chong alumni and current students to gather and engage in friendly sports competitions on the morning of the Mid-Autumn Festival (MAF) Celebrations. 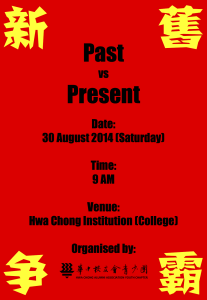 PVSP 2014 will be held on 30 August 2014 (Saturday) morning at Hwa Chong Institution (College Section). 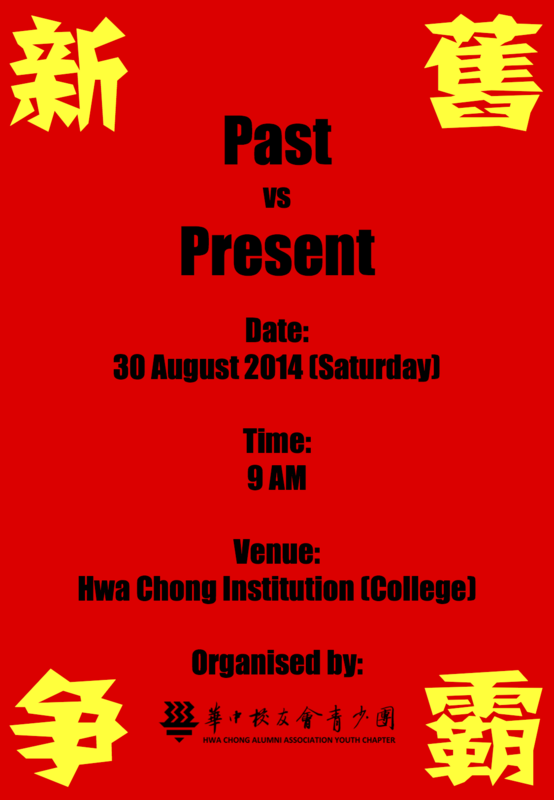 Form your teams and sign up at http://hwachongyouth.org/web/pvsp2014 before 28 August 2014.